An espresso drink is a specialty coffee drink that includes one or more shots of espresso that are “pulled” on an espresso machine (espresso maker) like those from Saeco that uses pressurized extraction in order to force very hot water under very high pressure through a compressed (e.g., compacted, tamped) bed of roasted, ground coffee. Sometimes mistakenly spelled “expresso”. Submit Your Espresso Recipe Here! Don’t have an espresso machine? Don’t sweat it. Most of these specialty coffee and espresso recipes can substitute the espresso portion with 4 ounces of strong brewed coffee from a french press, pour over or other drip coffee maker. What few people realize is that any coffee bean can be used to make an espresso shot and therefore used in an espresso-based drink recipe. 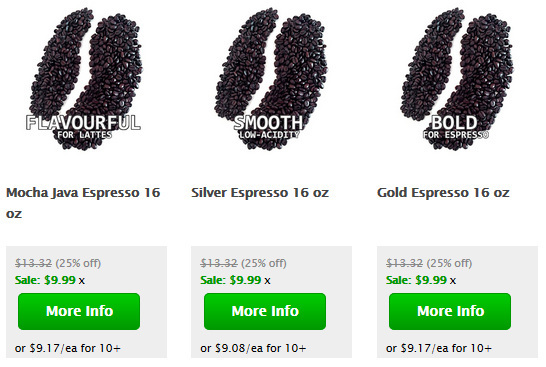 Espresso is typically a very dark roast, but can also be a medium or regular dark roast. What is important at the end of the day is ensuring you have the right grind for your equipment, which involves selecting an appropriate coffee grinder. 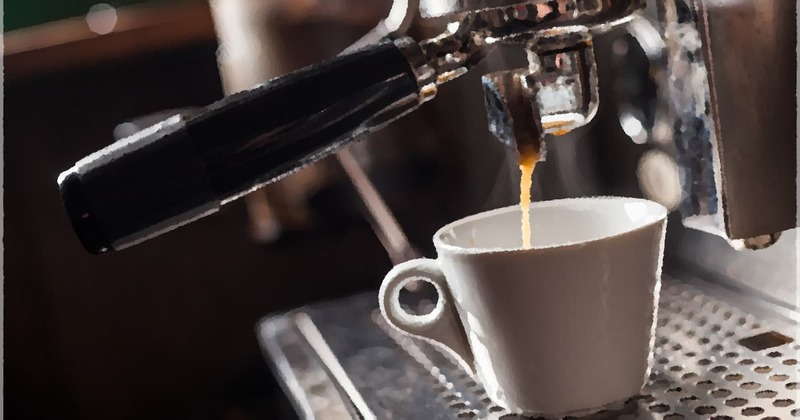 Espresso serves as the foundation for a wide variety of the best specialty coffee drinks, which are commonly known as espresso drinks and are popular in coffee houses around the world. Some special “espresso blends” make use of single origins that are known to have a bold, dark flavor such as the Sumatra coffee bean, blended with a robusta that is typically seen as a lower quality bean but is known to produce a better crema and contain more caffeine. Any of our recipes here can be made using the Ninja Coffee Bar, by substituting 2-oz of espresso for a 4-oz strong-brewed coffee with the Ninja Coffee Bar. The built-in frother makes steaming and frothing milk – an essential part of most coffee recipes – a breeze. The Ninja Coffee Bar is also able to handle the iced coffee recipes thanks to the “brew over ice” option plus combined with an XL-sized brew. The most well-known and best espresso drinks include the Cappuccino, Latte (Caffe Latte), and Mocha (Caffe Mocha), although there are many more, and everyone seems to have their own personal favorite recipe which they like prepared in their own special way (e.g., half-caf, non-fat, extra shot mocha, no whip). Many people enjoy their espresso drinks with a snack, and the most traditional foods to accompany espresso and espresso-based drinks are biscotti and brioche, perhaps a croissant, or an Italian desert such as gelato, sorbetto, or affogato. Check out recipes for these tasty foods in our Espresso Cuisine section. Espresso Recipes – Below are detailed instructions on how to prepare the following Espresso Drinks. To make an Americano, or Caffe Americano, pulling a single shot of espresso and then add about 6 ounces of hot water—the strength should be similar to drip filter coffee. Caffe Americano is the Italian way of serving espresso “American style”, ordering a “caffe” in Italy is to order a shot of espresso. Add milk and/or sugar if desired. To make a Black and White, pour one-half of an ounce of milk or vanilla schnapps into a shot glass and then pour one-half ounce of coffee liquor atop the drink. To make a Black Eye pull two shots of espresso and add them to a cup of brewed coffee. Also see Red Eye; Dead Eye. To prepare a Black Russian, fill a glass with crushed ice and then add 1.5 ounces of coffee liqueur and 1.5 ounces of vodka. See: Alcohol and Coffee Drink Recipes. A cappuccino with no steamed milk—instead it is filled with foam only. See Cappuccino. To make an Espresso Breve, pull one shot of espresso and add a small amount of heated or steamed light cream or half & half. Breve is the Italian word for “short.” For the recipe, see How to Make a Breve. This delicious French coffee drink recipe is prepared using strongly brewed coffee (French Press is best) or espresso served in a large, bowl-shaped cup (a white porcelain cup or bowl is best) along with heated milk or steamed milk but not foam. The hot milk is traditionally served in a separate pitcher, and then when everything is ready and proper, mix equal amounts of the two ingredients to taste. The open-mouthed cup or bowl-shaped cup enhances the beverage, and is also great for warming you hands on those chilly winter days. Another benefit of a large porcelain cup is that it is great for dipping your brioche or croissant, if you are a dipper. See the Espresso Coffee Guide’s tasty brioche recipe to make your own for the perfect Cafe Au Lait experience. Cafe Au Lait means “coffee with milk.” The French Cafe Au Lait is analogous to the Italian Caffe Latte. To make this Spanish drink, pull one shot of espresso into a small glass, then pour in an equal amount of condensed milk. The two liquids should stay separated until stirred. The French term Cafe Bonbon means “Candy Coffee.” See: How to Make a Cafe Bombon Recipe. Also known as Cuban Coffee and Un Cafecito, Cafe Cubano is typically twice as strong as American coffee. Cafe Cubano is very popular in Cuba and among the United States Cuban American community (e.g., in Miami). Commonly served in thimble-sized paper cups, Cuban coffee is often served at the end of a meal in tiny cups called tacitas, which are even smaller than demitasse cups. The traditional method of making a Cafe Cubano is using a pot on the stove though Cubans in the United States often use stovetop espresso makers. When you order Cafe Cubano drinks for a group it is known as a colada. To prepare a Cafe Cubano pour ice-cold water into the espresso maker (e.g., pot on stove) and fill it with the espresso beans. Screw the espresso pot together and place it on the stove burner. Place approximately two teaspoons of sugar into your cup and then when the coffee begins percolating pour a bit into your cup to moisten the sugar into a paste. When the coffee has finished brewing, slowly pour some into the cup and gently mix it with the sugary paste—this should create a foam. Now add the rest of the coffee. Also see: Cuban Coffee – Coffees of Cuba. To make this Spanish drink brew up a some dark roasted gourmet coffee and then mix in some sugar and serve it with heated milk. Warm buttered bread is also traditionally served. You can learn to make this at home yourself by following our How to make a Cafe Con Leche recipe. A Cafe Decaffeine is simply decaffeinated brewed coffee. Also see Decaffeinated Coffee. To prepare a Caffe Creme, pull one shot of espresso and add one ounce of heavy cream. A Caffe Creme is also called a Cafe Creme (Café Crème) and Espresso Creme. To make this Italian espresso drink recipe, pull two shots of espresso in a heavy, bowl-shaped cup, tall ceramic mug, or clear cup. Next add about three times as much steamed milk. As you pour the steamed milk into the cup use a spoon to hold back the foam until the cup is more than ¾-full. Now top it off with a small cap of foam. The term caffe latte comes from the Italian “caffe e latte,” which means “coffee and milk—this drink is analogous to the French Cafe Au Lait. Lattes are often flavored with sweet Italian syrups like hazelnut, almond, and other nut flavors. For detailed directions on how to make a Latte, see the Barista Guide To Perfect Lattes and Cappuccinos. Pull two shots of espresso and pour them into a tall glass. Now mix in one ounce of chocolate syrup or chocolate powder, and then add steamed milk until it is almost full. Top it off with whipped cream and then garnish it with some chocolate flakes. For a full recipe, see our How to Make a Cafe Mocha. The term Mocha is also spelled Moka, and originally referred to a particular variety of coffee which itself was named after a Yemen port near a traditional and renown coffee-growing region. To prepare a Cafe Noisette (pronounced Nwah-Zhet), pull a shot of espresso and then add just a small amount of milk. Noisette means hazelnut and refers to the drink’s color. To make this Italian beverage pull one or two shots of espresso into a Cappuccino. Now add about twice as much steamed milk as there is espresso, and then top it off with foam. Many purists prefer a recipe of 1/3 espresso, 1/3 steamed milk, and 1/3 foam, while others prefer 1/3 espresso and 2/3 foam. Still others say it should be 50% espresso, with the other half having equal amounts of milk and foam. For heaven’s sake—you be the judge! Optional garnishes include a sprinkle of ground chocolate, cinnamon, nutmeg, powdered cocoa, or vanilla powder. A request for a “dry cappuccino” means add more foam than usual, while “wet cappuccino” means add more milk. “Bone dry” means no milk (fill it with foam). The foam of a cappuccino should be wet and velvety, mixing naturally with the pour, and not simply sitting atop the drink like a large, bubbled meringue. For detailed directions see the Barista Guide To Perfect Lattes and Cappuccinos. A cascara latte is made using cascara (coffee cherry tea) as the base for a latte. A charcoal latte is a regular latte, with activated charcoal added to it. To make a Coconut Latte, pull two shots of espresso and combine them with one ounce each of coconut syrup (or canned coconut cream) and chocolate syrup. Almost fill the cup with steamed milk, then finish it off with a bit of foam. Now sprinkle some grated chocolate on top along with some grated toasted coconut. This twist on a traditional Vietnamese Egg coffee substitutes condensed milk with coconut cream to make it dairy-allergen friendly. See: How to make a Coconut Egg Coffee. A coffee nudge is an alcoholic drink that combines hot coffee with creme de cacao, Kahlua, brandy and is usually topped with whipped cream. To make this Spanish drink recipe brew up a some dark roasted premium coffee and then mix in some sugar and serve it with heated milk. Warm buttered bread is also traditionally served. CUBAN COFFEE – See Cafe Cubano. Also see Cuban Coffee – Coffees of Cuba. To make a Dead Eye pull three shots of espresso and add them to a cup of brewed coffee. Also see Red Eye; Black Eye. To make a Depth Charge pull one shot of espresso and add it to a cup of brewed coffee. A Depth Charge is also called a Shot-In-The-Dark; Pile Driver; Red Eye; or Eye Opener. To make a Double Espresso, pull two espresso shots (about 3 ounces total) using an espresso machine. A double espresso is best served in a slightly oversized demitasse or in a Cappuccino cup. Also see Pulling a Perfect Espresso Shot to make sure you are using the proper espresso grind size and follow the Technical Specifications for a proper espresso. A Double Espresso is also called Doppio Espresso; Espresso Doppio, Double Shot. A standard cappuccino recipe, with more foam than usual. See Cappuccino. To prepare an Espresso Creme, pull one shot of espresso and add one ounce of heavy cream. Also called Caffe Creme. To make an Espresso Cubano recipe, pull two shots of espresso “short,” which means that the extraction time should be less than the usual 18-22 seconds. Then add raw sugar to taste. Also see Cuban Coffee – Coffees of Cuba. To make a traditional Espresso Granita recipe pull two shots of espresso and add sugar to taste. Then put the beverage in the freezer, and when it is mostly frozen take it out and crush it up. The sugar will prevent the drink from freezing solid (thus the granularity). Serve the Espresso Granita in a cup with a spoon. Optional: Top it off with whipped cream. Also called Granita Espresso. Also see Granita Latte. ESPRESSO SHOT–See Pulling a Perfect Espresso Shot. To make an Espresso Con Panna, pull either one or two shots of espresso and top it off with a dollop of whipped cream. In Italian, “Espresso Con Panna” means “Espresso with cream.” For more tips see Pulling a Perfect Espresso Shot. Also see Pulling a Perfect Espresso Shot to make sure you are using the proper espresso grind size and follow the Technical Specifications for a proper espresso. An Espresso Doppio is also called Doppio Espresso; Double Shot. To make a traditional Espresso Granita pull two shots of espresso and add sugar to taste. Then put the beverage in the freezer, and when it is mostly frozen take it out and crush it up. The sugar will prevent the drink from freezing solid (thus the granularity). Serve the Espresso Granita in a cup with a spoon. Optional: Top it off with whipped cream. Also see Granita Latte. To make an Espresso Lungo pour one shot of espresso “lungo” or “long.” To do this the normal 1.5 ounces of water are dispensed through the espresso grounds using a longer (lungo) extraction time than usual, usually between 25-40 seconds as compared to the normal 18 to 22 seconds. An Espresso Lungo is also called Long Shot. To make an Espresso Macchiato pull a single shot of espresso “macchiato” (marked with) about 1½ tablespoons (a dollop) of foam. Some people instead prefer just a dash of steamed milk or cream. An Espresso Macchiato should be served in a demitasse. Some large chains such as Starbucks use a slightly different definition for their “Macchiato”. To make an Espresso Ristretto, or “Short Shot,” (ristretto means restricted), pull one shot of espresso, but only put about half as much water as usual into the espresso machine (instead of 1-1/2 ounces of water, just use 3/4-ounce). The water should dispense through the espresso grounds in about 18-20 seconds compared to the normal 22 seconds, and the grind size used should be even finer than usual. The slower extraction can also be accomplished by pressing or tamping the coffee down with extra pressure in the portafilter. Sweeter and more flavorful than a full shot, the Espresso Ristretto renders a thicker, stouter drink, emphasizing the intense espresso taste. The restricted extraction is meant to extract only the best qualities of the coffee and none of the bitter elements, with about the same amount of caffeine, creating a richer beverage that is more intense. It should be noted that preparing a high quality ristretto is a bit tricky because there is a fine balance between making a perfect ristretto and simply stalling an espresso machine. In Europe a ristretto is the preferred shot. Also called Short-Pull Espresso. This Espresso Romano recipe calls for a single shot of espresso and top it with fresh peel (twist or slice) of lemon—this is usually served on the side. Many say this espresso presentation is an Italian invention, but Italians deny it. Some gourmet coffee aficionados say the lemon interferes with the delicate flavor balance of the Espresso—you be the judge! To make an Eye Opener pull one shot of espresso and add it to a cup of brewed coffee. Also called Shot-In-The-Dark; Pile Driver; Depth Charge; Red Eye. To make a Granita Espresso, pull two shots of espresso and add sugar to taste. Then put the beverage in the freezer, and when it is mostly frozen take it out and crush it up. The sugar will prevent the drink from freezing solid and provide granularity. Serve the Granita Espresso in a cup with a spoon. Optional: Top it off with whipped cream. Also see Granita Latte. The American version of the Granita Espresso recipe calls for one shot of espresso and combine it with milk and sugar, then put it in the freezer. When it is almost frozen take it out and crush it up. Optional: Top it off with whipped cream. This drink is also made by special dispensing machines. The Iced Cappuccino recipe calls for you to pull one shot of espresso and pour it over ice, then add three ounces of cold milk. Now spoon a nice layer of foam atop the espresso. Sweeten if desired. This recipe for a classic Irish Coffee requires you to first pre-heat the glass using hot water. Then pour about one ounce of Irish whiskey into the glass and fill it almost full with brewed coffee that has been lightly sweetened. Next pour some thick, whole cream onto the back of a spoon that is resting just on the surface of the coffee beverage. The sugar in the coffee will help the cream float. An optional addition to an Irish Coffee is a big dollop of whipped cream on top. For a very detailed description see How To Make Irish Coffee. To make this Italian drink (Caffe Latte) recipe, pull two shots of espresso in a heavy, bowl-shaped cup, tall ceramic mug, or clear cup. Next add about three times as much steamed milk. A latte is most properly called a caffe latte—the term caffe latte comes from the Italian “caffe e latte,” which means “coffee and milk. This drink is analogous to the French Cafe Au Lait. Lattes are often flavored with sweet Italian syrups including such nutty flavors as hazelnut or almond. This Latte Macchiato recipe requires you to fill a cup with steamed milk and then put in pour the espresso on top so the drink is macchiato (“marked”) with espresso. Pour the espresso in slowly so that it forms a dark swirl in the glass. The long shot is the basis for many espresso recipes. To make a Long Shot pour one shot of espresso “lungo” or “long.” To do this the normal 1.5 ounces of water are dispensed through the compacted espresso grounds using a longer (lungo) extraction time than usual. A typical long shot may be extracted for anywhere from twenty-five to forty seconds. In contrast, a normal espresso not is usually only extracted for about twenty seconds. A Long Shot is also know as an Espresso Lungo. To make a Macadamia Mocha, pull two shots of espresso and add one ounce each of macadamia nut syrup and chocolate fudge syrup. Finish filling up the cup with steamed milk. Now sprinkle some toasted coconut atop the drink along with a dash of grated chocolate. A proper Espresso Macchiato recipe begins with a single shot of espresso, “macchiato” (marked with) about 1½ tablespoons (a dollop) of foam. Rather than foam, some people instead prefer just a dash of steamed milk or cream. An Espresso Macchiato is traditionally served in a demitasse. Also see Latte Macchiato. This Mocha recipe calls for two shots of espresso and pour them into a tall glass. Now mix in one ounce of chocolate syrup or chocolate powder, and then add steamed milk until it is almost full. Top it off with whipped cream and then garnish it with some chocolate flakes. To make a Mochaccino recipe, pull a single shot of espresso and mix in one ounce of chocolate syrup or chocolate powder. Then fill the cup almost full with steamed milk, and finally top it off with some foam. To make a Mocha Latte, pull two shots of espresso and pour them into a tall cup. Now stir in one ounce of chocolate syrup or chocolate powder, then top it off with steamed milk and foam. The end result should be about one-fourth espresso, one-fourth chocolate, and half milk and foam. A Mocha Latte is similar to a Caffe Mocha but more milk, and similar to a Caffe Latte but more chocolate! To make a Pile Driver pull one shot of espresso and add it to a cup of brewed coffee. A Pile Driver is also called a Shot-In-The-Dark; Red Eye; Depth Charge; or Eye Opener. Also see Black Eye; Dead Eye. The recipe for a Red Eye requires one shot of espresso, and adds it to a cup of brewed coffee. A Red Eye is also a called Shot-In-The-Dark or Pile Driver. To make an Espresso Romano, pull a single shot of espresso and then top it off with fresh peel (a slice or twist) of lemon—this is usually served on the side. Many say this espresso presentation is an Italian invention, but Italians deny it. Some specialty coffee aficionados say the lemon interferes with the delicate flavor balance of the Espresso—you will have to be the judge! To make a Short-Pull Espresso, also called a Short Shot or Espresso Ristretto, pull one shot of espresso, but only put about half as much water as usual into the espresso machine (instead of 1-1/2 ounces of water, just use 3/4-ounce). Sweeter and more flavorful than a full shot, the Short-Pull Espresso renders a thicker, stouter drink, emphasizing the intense espresso taste. The restricted extraction is meant to extract only the best qualities of the coffee and none of the bitter elements—with about the same amount of caffeine. In Europe this is the preferred shot. To make a Shot-In-the-Dark, pull one shot of espresso and then add it to a cup of brewed coffee. A Shot-In-the-Dark is also called a Red Eye; Pile Driver; Depth Charge; and Eye Opener. Also see Black Eye; Dead Eye. To prepare a shot of espresso you need to pull one shot of espresso—about 1½ ounces—using an espresso machine. The espresso shot is best served in a pre-warmed demitasse. Also see Pulling a Perfect Espresso Shot. To prepare a solo shot of espresso you need to pull one shot of espresso—about 1½ ounces—using an espresso machine. The espresso shot is best served in a pre-warmed demitasse. See Pulling a Perfect Espresso Shot. To make a spicy Viennese Espresso, pull two shots of espresso. The espresso is then mixed with 4 ground cloves, one-half teaspoon cinnamon, and one-half teaspoon allspice. Finally top it all off with a nice dollop of whipped cream. This is fairly close to a traditional Turkish coffee. To make a Split Shot Espresso, pull one shot of espresso using half decaffeinated gourmet coffee grounds and half regular (caffeinated) gourmet coffee grounds. This recipe is a great way to reduce your caffeine intake without going cold-turkey. Pull two shots of espresso and combine them with one ounce each of praline syrup, chocolate syrup, and caramel syrup. Fill the rest of the cup with steamed milk and a small amount of foam. Top it off with a sprinkle of grated chocolate and a dash of toffee shavings. To make a traditional Granita Espresso, pull two shots of espresso and then add some sugar to taste. Next put the beverage in the freezer, and when it is mostly frozen take it out and crush it up. The sugar will prevent the drink from freezing solid, and the word “granita” refers to the granularity of the sugar. Serve the Granita Espresso in a cup along with a spoon. Optional: Finally top it off with whipped cream. Also see Granita Latte. A turkish coffee is prepared in an ibrik (or cezve), using a very fine coffee that remains in the finished brewed (eg. not filtered), along with ground cardamom. See: Turkish Coffee Recipe. This recipes is simply a Brewed coffee topped with whipped cream. Also: Coffee brewed from coffee beans that were given a Viennese Roast. To make a spicy Viennese Espresso, pull two shots of espresso and mix it with 4 ground cloves, ½-teaspoon cinnamon, and ½-teaspoon allspice. Finally top it off with whipped cream and enjoy! A standard cappuccino recipe except with extra steamed milk. See Cappuccino. Make sure you start with quality ingredients – checkout our best coffees in the world for a starting point. Always make sure that you’re buying fresh roasted coffee, and preferably that you’re grinding the coffee beans at home before brewing for peak freshness. Check out our Espresso Cuisine section for great food recipes that use espresso or coffee as a base. You’ll want to familiarize yourself with the 3 Layers of an Espresso Shot. Thank You! for visiting Espresso Coffee Guide and Reading About Gourmet Espresso Drink Recipes! Savor Your Coffee and Espresso! The Coffee World is amazing indeed!!! 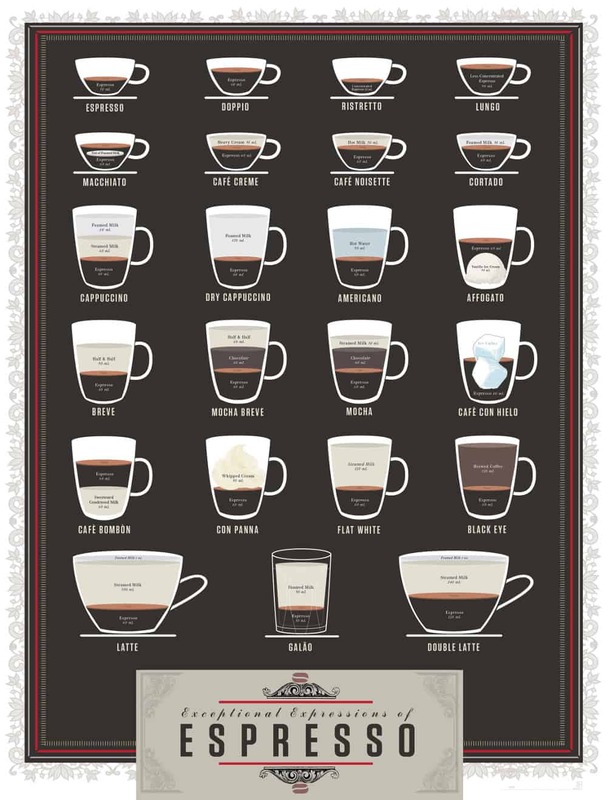 I’m wondering if you could add a better resolution image of the “Espresso Drink Chart”, i would like to set it up as a poster at my home workroom. Thank you, let’s all continue enjoying our cup of supreme coffee. What else would you call a Lungo? Looking for a term American consumers might be more familiar with. Thanks! Lungo is sometimes called a “long shot” in coffee shops.